The Star Wars special event for the International version of the game is finally here! We have put together this page to help explain the event and give some helpful tips and tricks about how to win the event! This guide will focus on Part 1 of the event as the two parts are very different. Part I will run until the end of May. Part II will start June 1st and run through June 19th... we will of course create a guide to Part II once it gets closer. This event is different than most of the previous events. 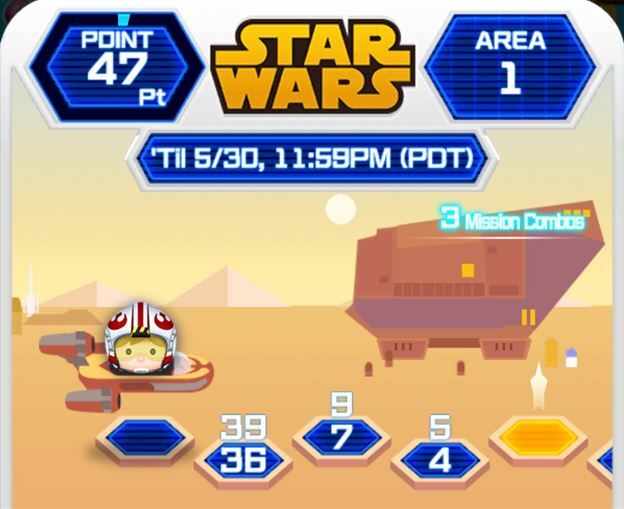 In the Star Wars event you have 3 different "areas" (or cards) that you will need to complete. 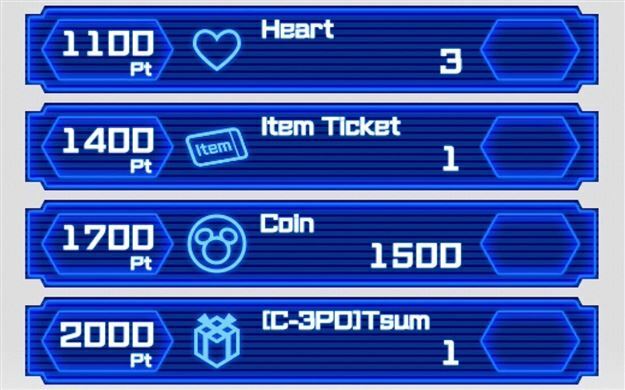 To clear a card you need to earn 2000 points via missions on that card. You do not need to get the the "end" of the board as there is no end... it just keeps going and going... it is only there for you to have steps to earn points and get to 2000 total. Once you have 2000 points you move to the next card/area. If missions get too hard you can "give up" on the mission and they will go back to being easier and you won't lose any of your points. Each area is set up a bit like a board game with a series of steps. Each step has a point value and a mission for it. Once you complete the mission for that step you will "roll a die" to see how many steps you move ahead. At the next step you will again have a point value and a mission to complete to get those points. Sometimes there will be gold steps. If you land on one of these you get 50 points for "free" and get to roll again. Sometimes if you are lucky you can land on several golden steps in a row and get a bunch of points quickly! 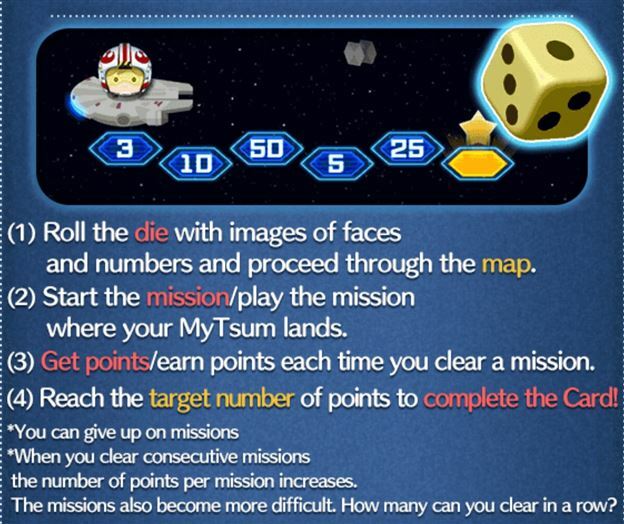 As you complete missions they will increase in difficulty but the points you get for each step will also increase! This means the more missions you complete in a row the quicker you will progress through the area! 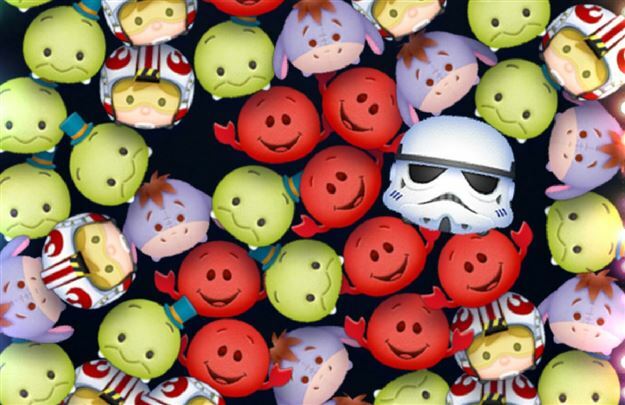 Occasionally when you land on a step Stormtroopers will interrupt you! 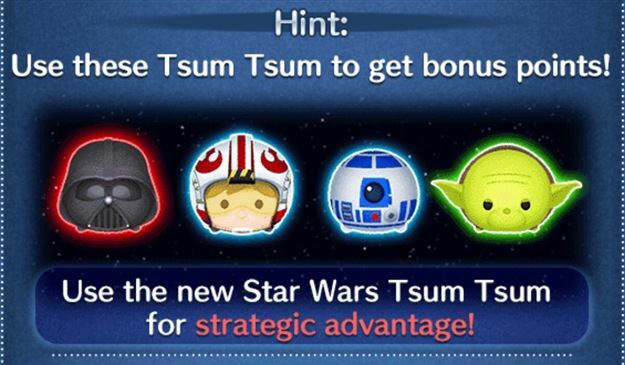 If this happens you will have to play a game where random Stormtrooper Tsums appear that you need to clear. 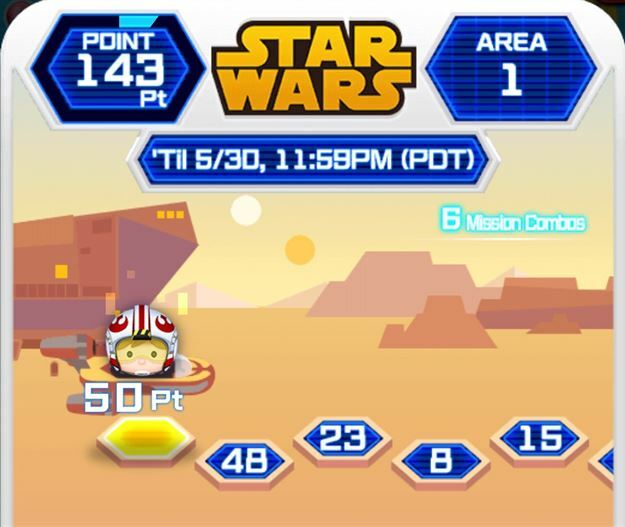 At the end of the game you will get a coin bonus based on how many Stormtroopers you cleared. After the Stormtrooper game you just continue as normal. 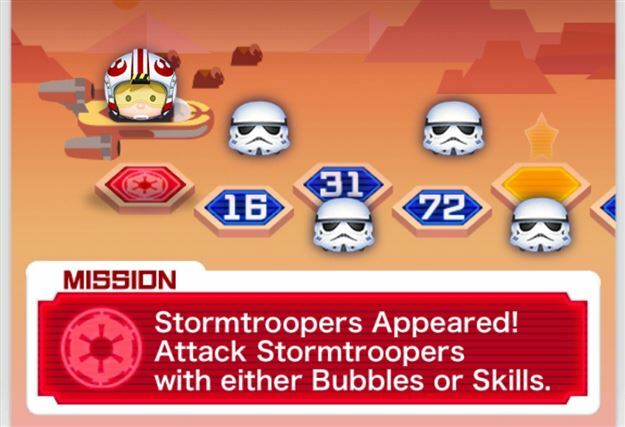 To clear a Stormtrooper you just need to hit it with a bubble or your Tsum's skill once and they appear pretty frequently and sometimes 2-3 at once. The different missions are similar to many Bingo Card missions. As mentioned above the missions will get harder the more missions you complete in a row but they will generally be the same type of missions just the numbers required will get bigger. Here are some tips for different mission types but remember if you get to a mission that is too hard you can skip past it and continue progressing! 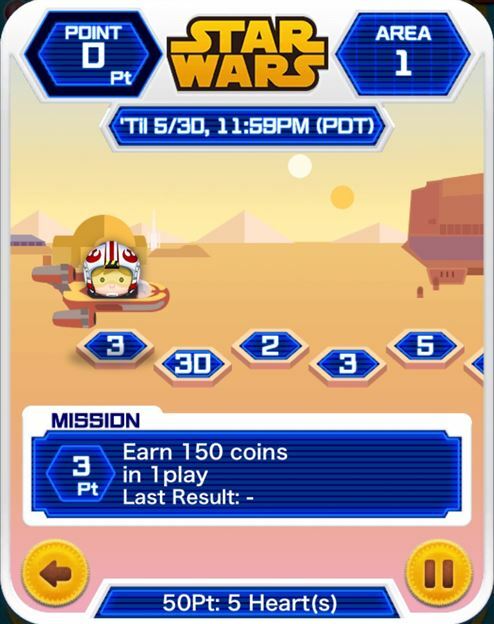 One thing to also know when playing is that if you use a Star Wars Tsum Tsum (except C3PO) you will get a bonus when you play. 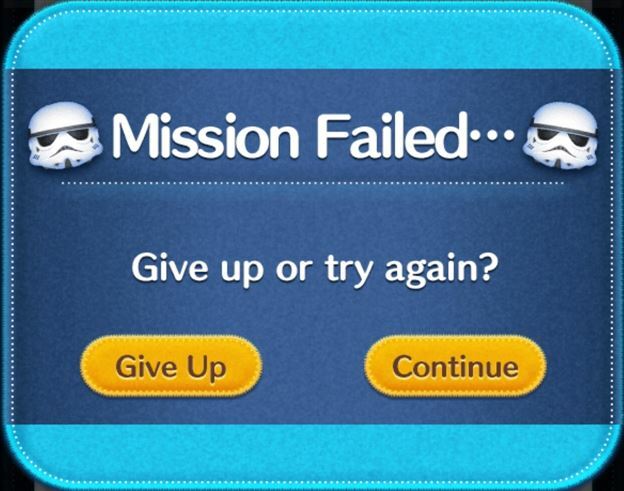 That means even if you don't quite beat the mission outright with the Star Wars bonus you will still beat it! Overall this event is a bit easier than Bingo cards as you have the option to skip past missions that are too hard. That being said, if you fail a mission but you think you can beat it, it can be better to keep trying since the points per step will reset and it will take longer to progress. Of course if it is too hard it is better to skip it and at least keep making progress. 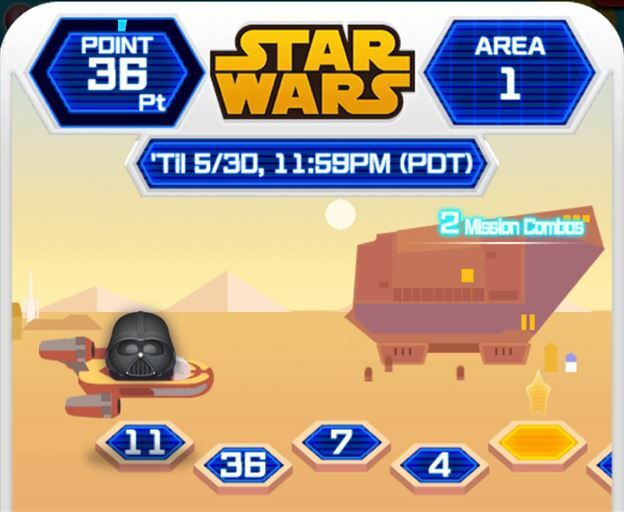 Discuss the Star Wars Event: Part 1!